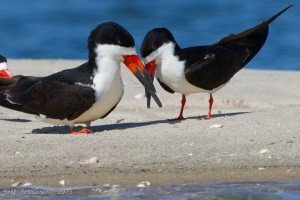 Each spring and summer, we walk many miles of Vineyard beaches to locate and protect nesting Piping plovers (Charadrius melodus) , American oystercatchers (Haematopus palliatus), Least terns (Sterna antillarum), Common terns (Sterna hirundo), Roseate terns (Sterna dougallii), and Black skimmers (Rhyncops niger). BiodiversityWorks cooperates with private landowners and beach associations so that people and birds may co-exist. 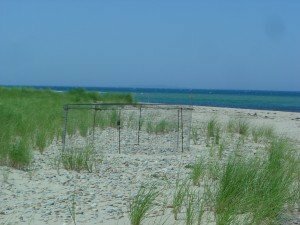 We focus on locating pairs, fencing their nesting areas to protect them from human disturbance and abundant predators (primarily crows, skunks, gulls, and cats), and sharing our appreciation for the birds with people we meet on the beach. Atlantic Coast Piping plovers are federally protected as a ‘threatened’ species, and they are also protected under the Massachusetts endangered species act. 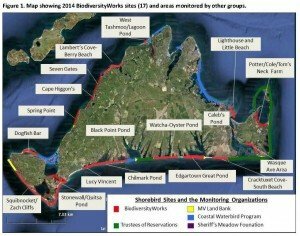 Currently, there are ~ 1,900 pairs nesting from Newfoundland to North Carolina. The recovery goal for this population is 2,000 pairs, with an average productivity of 1.5 chicks per pair over a five year period. 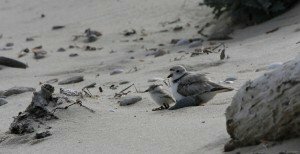 In 2016, we protected 28 pairs of Piping plovers at 11 sites. These pairs hatched 56 chicks, but fledged only 28. At least half of chick losses were to American crow predations. A native species that has increased to unnaturally high population levels due to human food subsidies. Click here to read more about the Piping plover and here for a slideshow. 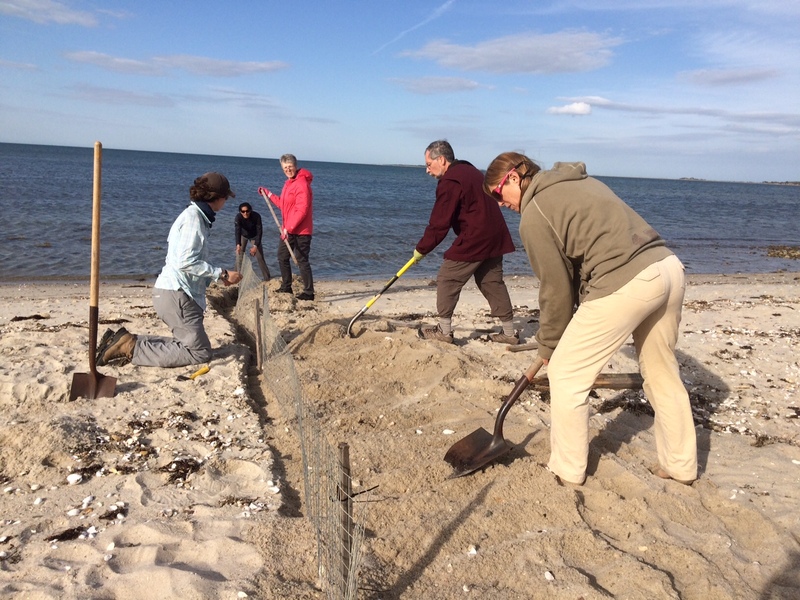 We use predator exclosures at some sites to protect piping plover nests from egg predators. It takes 3 -4 people about 15 minutes to exclose a plover nest, and we must have a permit from the state to use these exclosures. We are grateful when volunteers are able to help us. The plovers walk through the fencing to sit on their eggs. Both the male and female incubate the eggs, switching 2-3 times per hour for approximately 26 days. 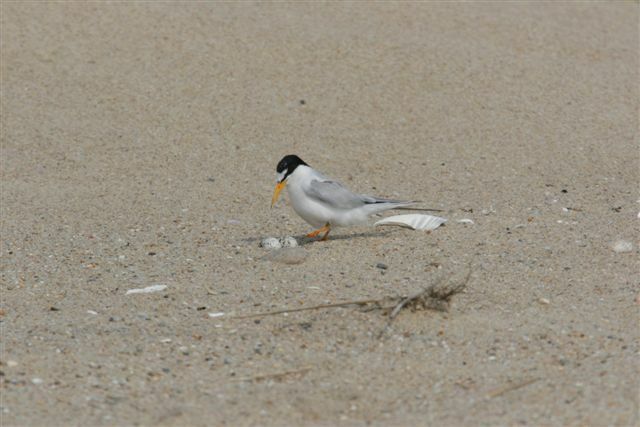 Least terns are protected as a ‘species of special concern’ in Massachusetts, and they often share nesting habitat with Piping plovers. 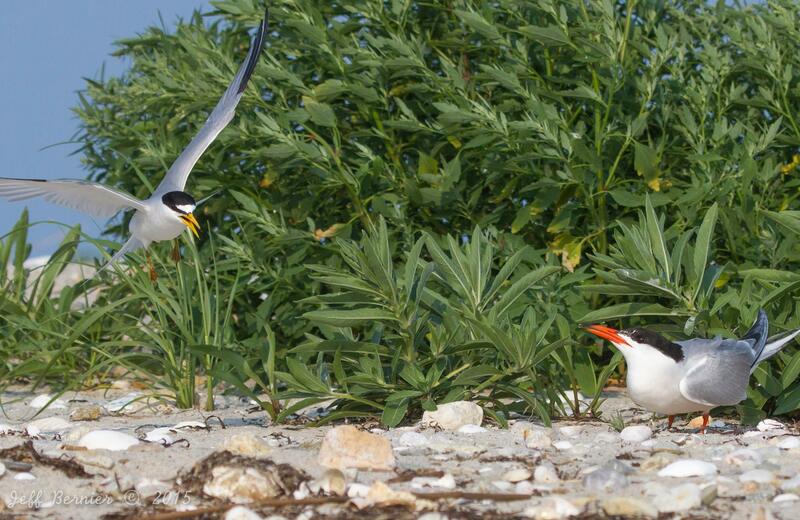 We protect 3-6 colonies of Least terns annually. This species is remarkable in that it can nest in colonies ranging from just a few pairs to hundreds of pairs. In 2016, several small colonies failed due to skunk predation on eggs. A few pairs fledged chicks, and others moved to a larger colony where they were able to hatch and fledged chicks later in the summer. 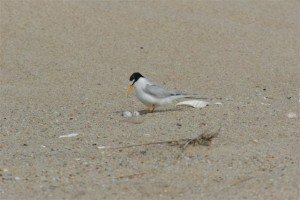 Click here to learn more about Least terns. 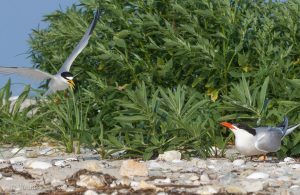 We can’t always predict the location or size of a colony from year to year, so terns require that we be able to respond quickly to colony initiation with protective predator fencing. Even one skunk raiding for eggs can cause complete colony failure in only a few days. 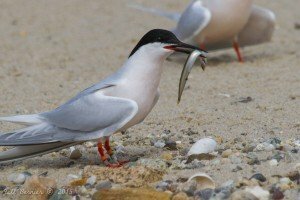 In 2011, a peregrine falcon caused abandonment of several tern colonies on the island, and in 2015 a couple of tern colonies were raided by crows. 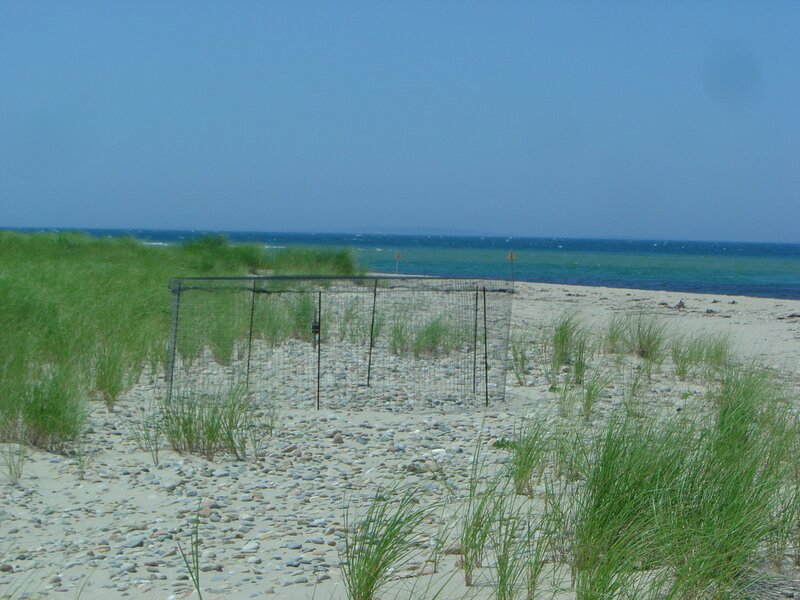 Little Beach, owned by Sheriff’s Meadow Foundation, has become a very productive site for nesting birds. In 2015, 75 pairs of Common terns, 10 pairs of Roseate Terns and and 5 pairs of Black Skimmers also nested on the narrow spit. American Oystercatchers are easily spotted on beaches, salt marshes, and small islands where they nest. 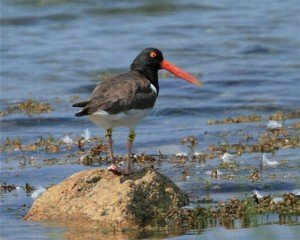 In 2016, we protected 12 pairs of oystercatchers nesting at 10 sites. They hatched 8 chicks and fledged 4. Nests were lost to skunks and crows at some sites and crows and dogs caused chick losses at others. 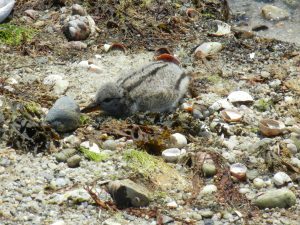 Oystercatcher chicks sometimes lie motionless in the wrackline (seaweed) on the beach where they could be stepped on by people or dogs. It’s important to stay away from posted nesting areas. 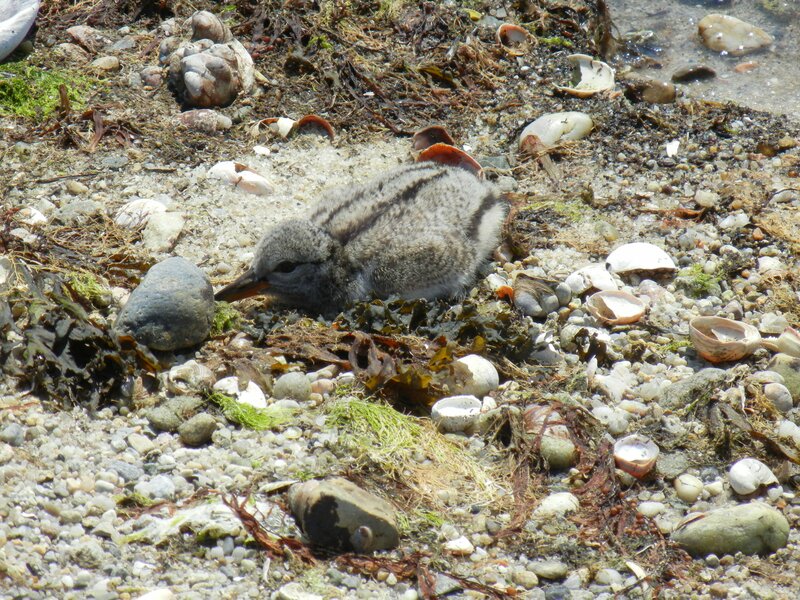 We are collaborating with the American Oystercatcher Working Group t o locate new nesting areas, protect nesting pairs, re-sight banded birds from prior years, and to learn more about the migration habits of these birds. 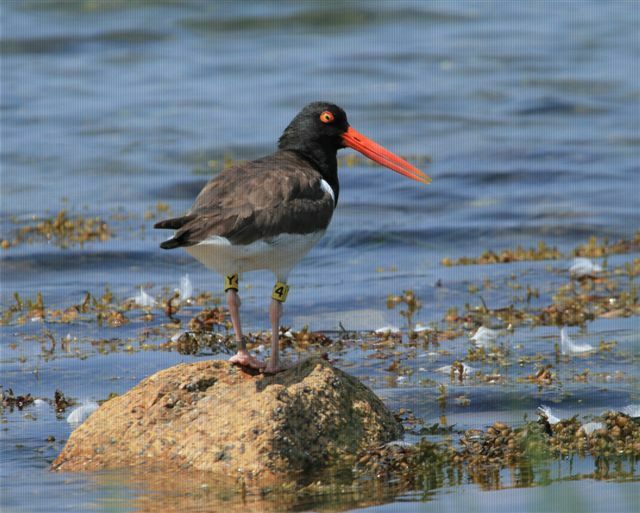 Click here to learn more about the American Oystercatcher. If you are interested in volunteering with our beach-nesting bird program, visit our volunteer page for more information.